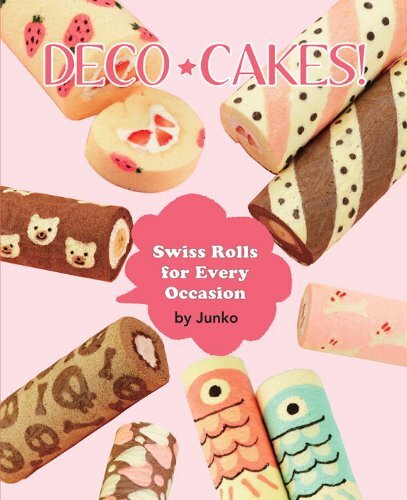 Junko has written several cookbooks with some of the cutest ideas and designs, well illustrated and explained to be easy to recreate in your home kitchen. Unfortunately, most of them haven't been translated to English. Just this one so far! This was a great choice to translate, and I'm so glad to have it. There are a lot of fantastic designs. For Mother's Day, Christmas, Valentine's, and all-occasion cakes, this is a great collection. There are tips for decorating and packaging to turn your gorgeous cakes into gifts for friends. Believe it or not, the decorated versions are even better than the cover photos. The baked inlaid designs are impressive looking on their own, combined with themed decorations, it takes it right over the top into something that looks very professional. To start with, you'll need a 25x25 cm swiss roll pan to make the cakes following the recipes in the book. Unfortunately, that's not a common size in the USA, but a 10x10 inch square pizza pan will work just fine. I imagine a 10 x 10 inch cake pan will work too, but it's easier to get the cake out of the shallow pizza pan than a deep cake pan. A 10 inch pan is just a tiny bit bigger than 25x25 cm. The instructions are written originally in precise weight based measurements that are used commonly, and to get the exact cake recipe recommended, you'll also need a kitchen scale. However, US style volume measurements are included. After that, it's just following the step by step instructions, which also include filling ideas. These cakes have lots of flavor and texture coming from the combination of cake, cream and fruit fillings. If your only experience with jelly roll cakes is the kind sold in supermarket bakeries, or worse luck, those chocolate dipped, plastic wrapped individual cakes- these will be a revelation. Great flavors using good ingredients makes a big difference. The designs are fantastic, for the more complex designs, there are stencils to trace on parchment paper to follow. For the simple designs, they are well illustrated and the techniques explained well. You don't need to be an artist to make a fantastic looking cake using this method. It's nearly as simple as a coloring book. Some of the designs have elements painted on after baking, but most of the design is done before that. I absolutely recommend it. If you have your own ideas, but just want to practice with the technique and get a good recipe for making these gorgeous confections- it's a good starting point. If you want to be able to make impressive looking from scratch cakes with minimal effort, it's a good choice. Published by Vertical Inc., check out their Facebook page!